Who Unfollowed you on Twitter? Find out using Qwitter | Kunal says...! 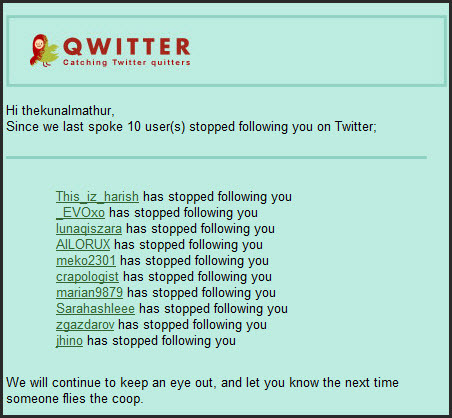 It feels good to get a mail whenever someone follows you over Twitter but losing a follower is not so happening event. Even worse, you can not figure out that who stopped following you (in case you have a good number followers). Now, you can find out that which Tweets made you lose followers. This is a Free application so go ahead and make best use of it.